WOW! You always manage to hit it bull eye. I am truly gorwing ot appreciate this site and the insight into God’s grace it provides. Also, the emphasis upon different art forms and story is one which is so needed. Thank you. I will be back. Thank you Jason. Your comment is very encouraging and extremely kind. I hope you check back often or even join through a suscription. Blessings. Thank you brother. I love the quote and it is so true. One of the truly amazing things about the grace of christ (and most difficult to understand) is how it works in us dispite our lack of understanding. We are so fallen and yet He loves us still. This film is one of my favorites ever. I have used it in a high school youth group to explore faith in a world of sin. I love your fashioning of grace. Thank you! BTW, love the Cash post you gave me. Blessings and grace to you. I love this film, and everything about it; from it’s depiction of Sonny’s struggles to the shot of him preaching to other prisoners while working hard labor at the end. If you haven’t seen it, another I would recommend with Duvall is “Tender Mercies.” He plays a washed up alcoholic country singer trying to pull his life together. Faith is an important element in that movie as well. Thanks Ryan and Odgie. Ryan I thought you would enjoy the Cash post. Check bacck from time to time becuase we will be looking closer at him. Odgie, you are so right about “Tender Mercies”. 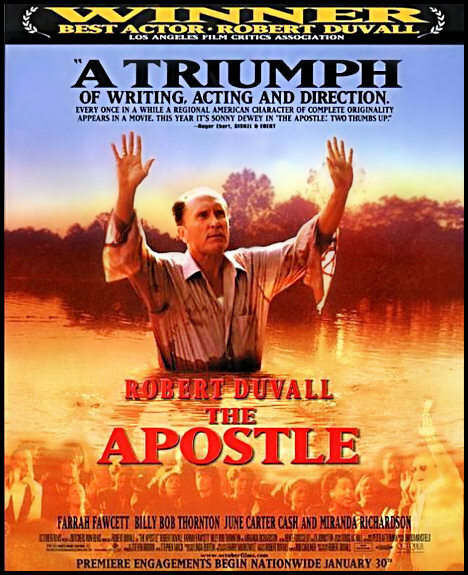 I have read that Duvall is a “lifelong beleiver” and the themses of sin, forgiveness, grace and redemption seem to run through allot of his characters. Your encouragement and comments are so kind. Thank you! Pastor, I have not seen this movie but it is now first on my list of movies to see. Your blog is great. Let me know if you like it. Blessings! I thought the film was excellent too. I was challenged and encouraged. It was a movie about grace. It’s one of my all time favorite movies! Mine also! Thank you Trey. I use this film as a finale to the Senior Philosophy class I teach at a Christian high school. The “Sonny dichotomy” really strikes them…how can such a horrible sinner bring so many to Christ, and love Christ so much? I ask them to compare themselves to Sonny, and almost all students closely identify with his struggle with sin. I loved your article, and will be adding some aspects from it concerning grace to my material. Thank you very much! Thanks Donna! I love the titel the “Sonny Dichotomy”.